This article is about the decorative motifs. For other uses, see Diaper (disambiguation). Diaper is any of a wide range of decorative patterns used in a variety of works of art, such as stained glass, heraldic shields, architecture, and silverwork. Its chief use is in the enlivening of plain surfaces. For the etymology see "diaper". The Oxford dictionary gives the Greek dia for "cross" as in "diamond" or "diagonal," and aspros, Greek for "white". A white diamond or white cloth is used on the diagonal, hence the diagonal lattice or reticulation in patterning. In architecture and other decorative arts, diaper is applied as a decorative treatment of a surface with a repeat pattern of squares (chequers), rectangles, or lozenges. 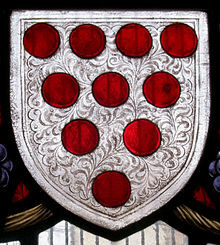 Diaper was particularly used in mediaeval stained glass to increase the vividness of a coloured pane, for example the field in a shield of arms. A stone wall may be decorated with such a pattern sculpted in relief; in brickwork the effect may be achieved by using bricks of different colours, or by allowing certain bricks to protrude from the wall's surface to create a regular diamond-shaped pattern. In English flushwork, limestone and dark knapped flint are used. Windows may be set in a diamond-shaped lattice. In Chinese carved lacquer, a convention developed by which the areas of sky, water and floor or ground that would be left largely blank in paintings are filled in with discreet patterns derived from textiles, known as "diaper backgrounds" and also "brocade-grounds"; this convention has continued to modern times. In heraldry, diapering is a technique in which those who emblazon, draw, paint, or otherwise depict achievements of arms decorate large areas of flat colour by drawing crosshatches or arabesques. There is no standard, and each artist is allowed individual idiosyncrasies. With very rare exceptions, diapering is not a part of the blazon, but is mere decoration, or ornamental accessory. Thus a shield with diapering is considered the same as a shield of the same design but without diapering. For this reason diapering must not be so obtrusive or so heavily drawn that it could be mistaken for a substantive charge or for a variation of the field. This is especially the case with diaper of simple cross-hatching which might be mistaken for a field of lozengy. Royal Burgh of Cullen, a 20th-century armorial: Per fess sable and argent, in chief on a sedilla or cushioned gules diapered or the Blessed Virgin enthroned proper habited gules mantled azure crowned or and holding in her dexter hand a sceptre surmounted of a fleur de lis or and in her sinister arm the Holy Child enhaloed also proper in base a talbot passant of the first (Public Register, vol 41, p 37, 1956). Wikimedia Commons has media related to Diapering in heraldry. ^ Vadnal, Jane. "Glossary of Medieval Art and Architecture: Diaper". University of Pittsburgh. Retrieved April 11, 2010.